Kendall Wesenberg of Modesto, Calif., launches into her training run on the skeleton track in Lake Placid, N.Y.
Matt Antoine, who won the bronze medal at the 2014 Winter Olympics in Sochi, Russia, dives onto his sled from a full sprint. "You always have to be on your toes in the sport," he says. "When you're moving 80, 90 miles an hour, you can't get lazy." 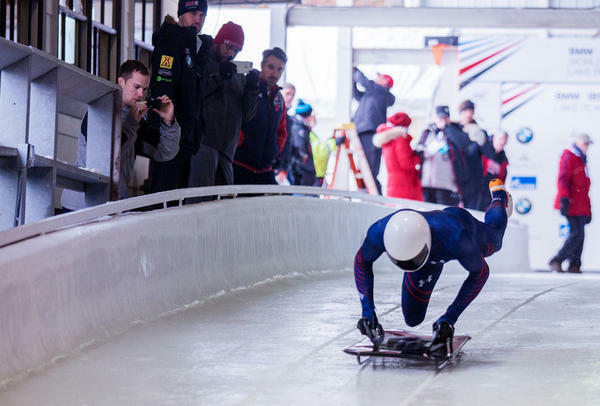 Olympic veterans and hopefuls in skeleton from countries around the world took practice runs in November in Lake Placid, N.Y., leading up to the bobsled and skeleton World Cup races. Matt Antoine (left) of Prairie du Chien, Wisc., won bronze in skeleton during the 2014 Winter Olympics in Sochi, Russia. Katie Uhlaender (center) of Breckenridge, Colo., is aiming for her fourth Olympics. John Daly from Smithtown, N.Y., has competed in skeleton in two Winter Olympics. 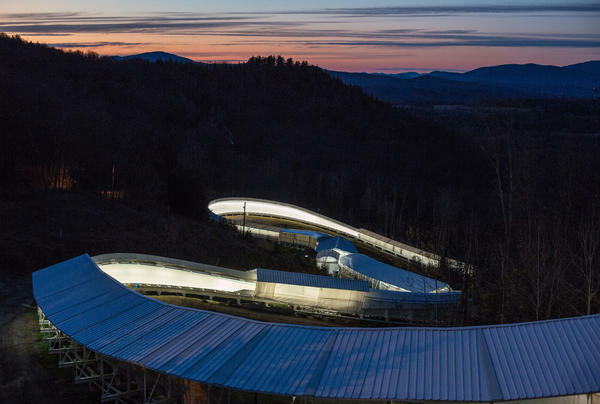 It takes elite skeleton athletes less than a minute to race down the mile-long, 20-curve track in Lake Placid, reaching speeds up to 90 miles an hour. Savannah Graybill of Denver, Pa., a skeleton racer with the U.S. national team since 2011, warms up near the starting line at Lake Placid before a training run. "Ever since I was a kid, I've always loved thrills and adrenaline," she says. Poised on the starting block in Lake Placid, N.Y., Kendall Wesenberg is vying for one of three women's skeleton spots on Team USA for the 2018 Winter Olympics. What lures athletes to this sport? "It is the perfect combination of meathead and freestyle zen athlete," Uhlaender says. "And," she adds with a grin, "due to my short attention span, it suits me well!" It takes less than a minute for an elite skeleton athlete to race down the mile-long track: 50-some seconds of speed thrills. For Uhlaender, the key to success is submitting to her fear. "I embrace it," she says. "I start going with gravity, and then find myself wanting more. So I start chasing the speed and just dancing with the curves. It's like those dreams where you're flying, except if you mess up here, you're going to hit a wall!" Savannah Graybill, 29, remembers the first time her parents came to watch her race several years back. They were standing just inches away, alongside the track in Lake Placid, New York, watching as their daughter's sled slammed into a wall and hit a patch of exposed concrete. "And sparks fly everywhere," Graybill recalls. Her parents ran to the finish line, terrified. "They're expecting to see me come up through the finish line, you know, missing an arm," she says, "and they're freaking out: 'We just saw sparks! We saw you come through here; we thought you were dead!' I'm like, 'Oh no, it was fine.' And they're just looking at me like, 'What are you? Are you crazy? You're literally crazy.' "
According to Olympic bronze medalist Matt Antoine, 32, watching skeleton might be scarier than actually doing it. "Sometimes when I'm watching other sleds go down the track, I don't even realize how fast we're going," he says. But, he adds, maintaining a bit of fear is wise: "You always have to be on your toes in the sport. When you're moving 80, 90 miles an hour, you can't get lazy." A skeleton run starts with a burst of explosive speed and power. The athletes dash for about 30 yards on the ice, pushing their sleds with one hand. Picture trying to sprint while you're folded in half, with one hand on the ground. "It's a very awkward, bent-over position," Antoine says, one "you would never do in track." After the push, skeleton racers dive onto the sleds head first (they are wearing helmets), trying to mold their bodies into the sleds and relax, staying as still as possible while going 90 miles an hour. They endure forces up to 5Gs going around the curves. Steering comes through small movements of shoulders and knees, pressing into the sled so it flexes. The racer's feet hang off the back; head and neck, off the front. The chin rests just an inch or two off the ice. "Obviously, you don't want your face scraping across the ice, 'cause it does slow you down," Antoine says. "But it also doesn't feel good." Skeleton racers have to keep their heads aerodynamically low to reduce drag, so they can only see a few feet ahead of them. But they've memorized the course ahead of time, visualized the curves and planned their lines. 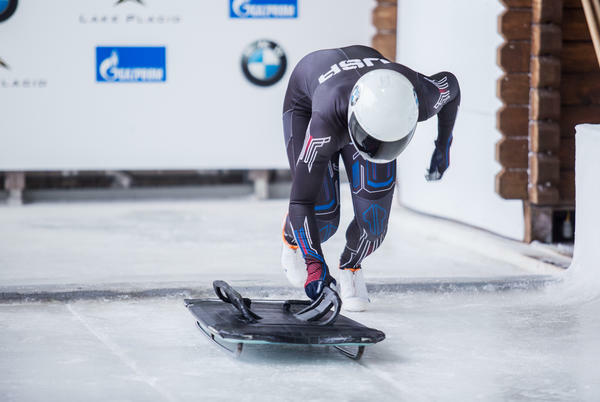 "For me, I feel the ice move under my chest, so that's how I can feel the pressures and know how to direct my sled," Uhlaender says. "And I almost visualize myself from a bird's-eye point of view of where I want to end up, and I somehow end up there. It's like The Force!" Skeleton, which returned to the Olympics in 2002 after decades of absence — and whose name derivation is a matter of debate — is a niche sport, so it recruits natural athletes who have excelled in other disciplines. Graybill's sport was field hockey. She was recruited for bobsled after college, but found she wasn't big and strong enough to be a contender, so she made the switch to skeleton. "It was a natural fit," she says. "Ever since I was a kid, I've always loved thrills and adrenaline. I loved sledding. I loved roller coasters. I loved anything that could give you that rush." Going into her first skeleton run, Graybill was terrified. "I remember feeling like I was going at warp speed, and getting down to the bottom and checking that everything was still there, and thinking, 'OK, I need to go back up and do this again,'" she says. "That was way too cool." Antoine grew up snowboarding and running track in Wisconsin. He saw skeleton for the first time on television during the 2002 Olympics in Salt Lake City, and was hooked. He arrived in Lake Placid for his first sliding school a few months later, when he was 17. "When you first come into skeleton, you really have no idea what to expect," he says. "You just kind of hold on and hope for the best." Twelve years later, Antoine was standing on the podium in Sochi, Russia, with an Olympic bronze medal around his neck (and because of the Russian doping scandal, he's slated to be upgraded to silver). As for Uhlaender, she competed in a wide range of sports in high school: skiing, power lifting, track and baseball — a passion she inherited from her father, Ted Uhlaender, a major-league outfielder for eight seasons. "I played baseball all the way until I couldn't," Katie says, "until I realized I was five foot three and female, and the major leagues were a far reach." When a fellow athlete proposed she try skeleton, she proved a natural, zooming up improbably fast through the ranks. 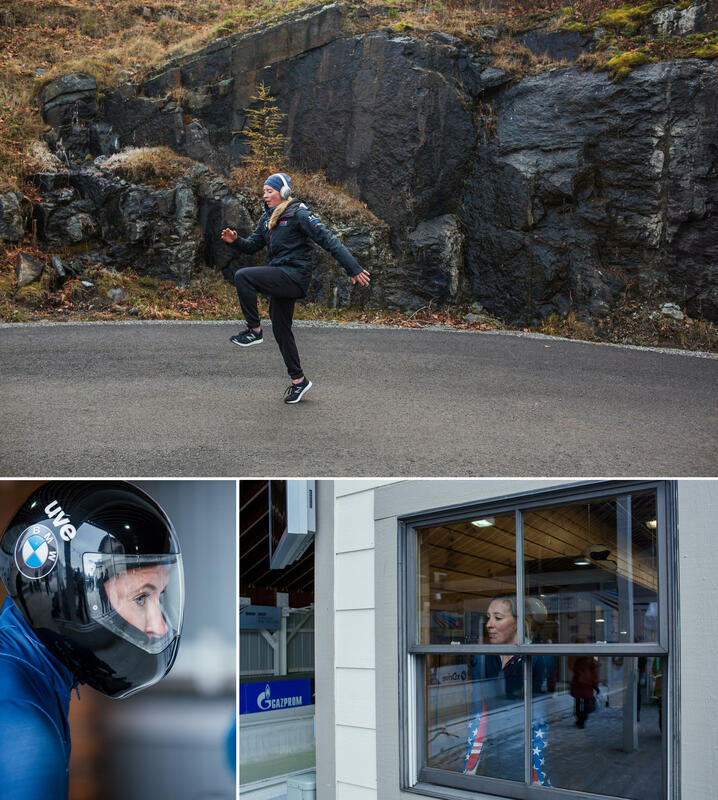 Just a few months after she took her first skeleton run, she won the women's national championship, and the coaches started grooming her for the Olympics. Now, assuming she makes the 2018 U.S. Olympic team, she'll be competing in her fourth Olympic games. 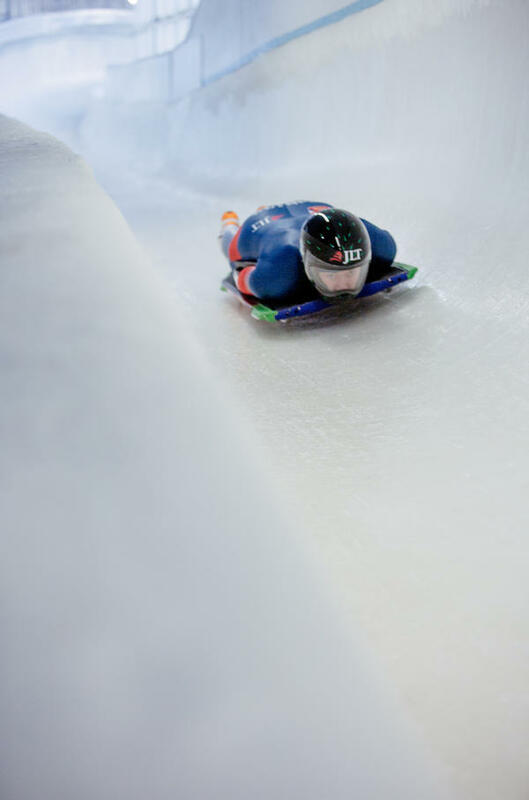 The sensation of skeleton, Uhlaender says, is like nothing else you can imagine. "You have a free-falling feeling," she says, "basically like a water slide, but epically fast." Before he was banned for gambling, baseball player Pete Rose was famous for the headfirst slide, the definition of a player who puts it all out on the field. Here's an Olympic sport that consists entirely of a headfirst slide. Competitors at the Olympics in South Korea will ride sleds on their stomachs headfirst 90 miles an hour. NPR's Melissa Block met Americans training for skeleton. UNIDENTIFIED MAN: Sled in track, sled in track from start one. This is Katie Uhlaender. KATIE UHLAENDER: Hi, I'm Katie Uhlaender - three-time Olympian, World Cup champion and world champion for the sport of skeleton. UHLAENDER: I go headfirst on ice, and I love it. UNIDENTIFIED MAN: Katie U. will be through curve 19, crossing the finish line with a down time of 55.61. MELISSA BLOCK, BYLINE: That's right. In the time it's taken us to get this far in this story - 55 seconds - a skeleton athlete will have hurdled down a mile-long track headfirst, face-down, at speeds up to 90 miles an hour. UHLAENDER: It is the perfect combination of meathead and freestyle as an athlete. Honestly, like, and I think due to my short attention span, it suits me well. BLOCK: Katie Uhlaender is 33, her hair dyed a vivid crimson. Growing up, she competed in just about everything - skiing, powerlifting, track, baseball. UHLAENDER: Yeah. I played baseball all the way until I realized I was 5-foot-3 and female and the major leagues were a far reach (laughter). BLOCK: After high school, she turned to skeleton and found it was a natural fit. She zoomed up the ranks super fast. When she's racing, Uhlaender loves submitting to her fear, embracing it. UHLAENDER: I start chasing the speed and just dancing with the curves. It's like those dreams where you're flying, except if you mess up here, you're going to hit a wall (laughter). BLOCK: Speaking of which, picture this scene a few years back. Another skeleton athlete, Savannah Graybill, is racing right here in Lake Placid. It's the first time her parents have come to watch her race. They're standing just inches away, watching as her sled slams into a wall and hits a patch of exposed concrete. SAVANNAH GRAYBILL: And sparks fly everywhere. BLOCK: Her folks run to the finish line terrified. GRAYBILL: And they're freaking out, you know. We just saw sparks. We saw you come through here. We thought you were dead. I'm like, oh, no. It was fine. And they're just, you know, looking at me like, what are you - you're crazy. You're literally crazy. BLOCK: So is it as scary as it looks? MATT ANTOINE: Watching skeleton is maybe a little more scary than actually doing skeleton. Even for myself, sometimes when I'm going watching other sleds go down the track, I don't even realize how fast we're going. BLOCK: This is skeleton racer and Olympic bronze medalist Matt Antoine. ANTOINE: I think maybe you have to have a little bit of fear because you always have to be on your toes in this sport. When you're moving 80, 90 miles an hour, you can't get lazy. BLOCK: After you dive onto the sled, you have to mold your body into it and relax. Staying as still as you can, going 90 miles an hour, you steer with small movements of your shoulders and knees. Your feet hang off the back, your head and neck off the front. Your chin is just an inch or two off the ice. ANTOINE: Obviously, you don't want your face scraping across the ice because it does slow you down, but it also doesn't feel good. BLOCK: You keep your head aerodynamically low so you can only see a few feet in front of you. But you've memorized the course ahead of time, visualized the curves and planned your lines. UHLAENDER: For me, I feel the ice move under my chest, so that's how I can feel the pressures and know how to direct my sled. UHLAENDER: And I almost visualize myself from a bird's eye point of view of where I want to end up and I somehow end up there. It's like the force. BLOCK: As another skeleton athlete tells me, we get to go 90 miles an hour headfirst - that never gets old. Melissa Block, NPR News. Transcript provided by NPR, Copyright NPR.